Cruise aboard the magnificent Celebrity Eclipse from Chile north along the coast towards San Diego. 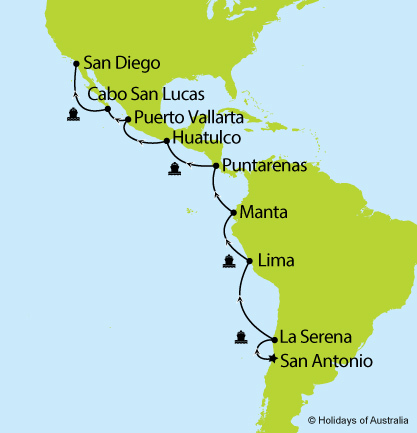 15 nights aboard Celebrity Eclipse cruising from San Antonio to San Diego with port calls in La Serena (Chile), Lima (Peru), Manta (Ecuador), Puntarenas (Costa Rica), Huatulco (Mexico), Puerto Vallarta (Mexico) & Cabo San Lucas (Mexico). Includes on board meals and entertainment. Itinerary & pricing correct as of 8 August 18 and is subject to change or substitution.